Literary Nonfiction. Poetry. Winner of the Oregon Book Award for General Nonfiction, 2016. 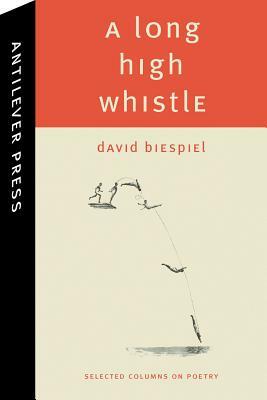 Over the course of ten years, poet and critic David Biespiel published a brief, dazzling essay on poetry every month in what became the longest-running newspaper column on poetry in the United States. Collected here for the first time, these enormously popular essays, many of which have been revised and expanded, offer a fresh and refreshing approach to the reading and writing of poetry. With passion, wit, and common sense, they articulate a profound and entertaining statement about the mysteries of poetry and about poetry's essential role in our civic and cultural lives. A LONG HIGH WHISTLE discusses the work of nearly a hundred poets from ancient times to the present, in English and in translation--among them Catullus, Ovid, John Keats, Walt Whitman, Emily Dickinson, W. B. Yeats, Osip Mandelstam, Robert Hayden, Muriel Rukeyser, Pablo Neruda, Elizabeth Bishop, Seamus Heaney, Tomas Transtr mer, Inger Christensen, Natasha Trethewey, and many others. This collection will provide anyone, from the beginning poet to the mature writer to the lover of literature, with insights into what inspires poets, how poems are written and read, and how poetry situates itself in American life.